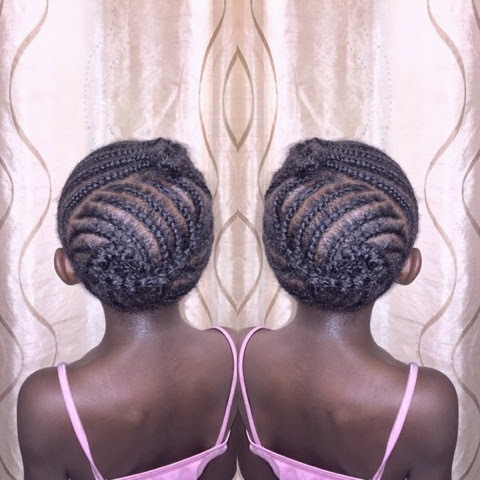 So my mini me requested a style that would last for a month because she does not like doing her hair. Her scalp is very tender, so I understand. The last style she wore lasted for a month as well. I now know that the excessive moisturizing is unnecessary. 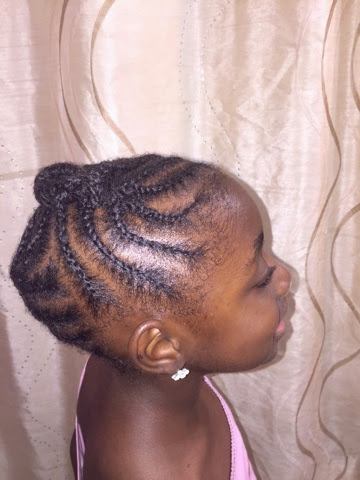 I only moisturized her hair once a week throughout the month and her hair was so soft and strong when I took the cornrows out. 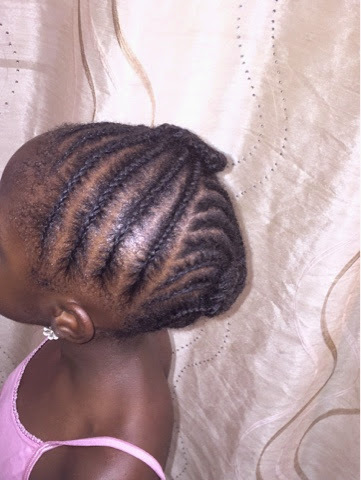 I made sure to use a product that kept her protein/ moisture balance in check. That product is none other than the Shea Moisture Yucca and Baobab Moisturizing Mist for fine and thin hair (the green line). 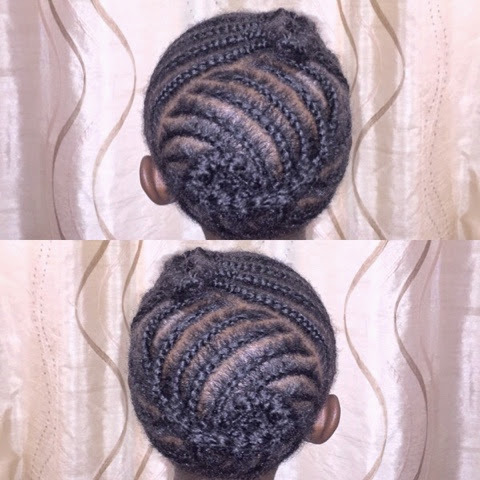 I used the new Shea Moisture Jamaican Black Castor Oil Strengthen Grow & Restore Edge Treatment around her edges. I immediately tied down her hair with a scarf to lay down the flyways. 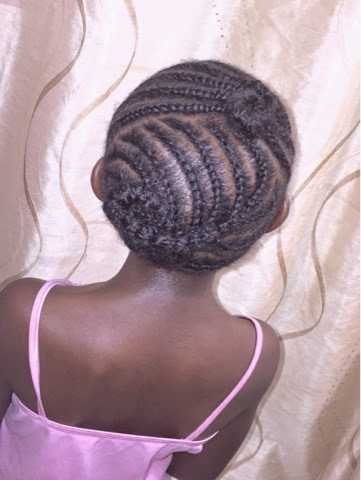 After washing and conditioning her hair with the Shea Moisture Mango and Carrot Kids Extra-Nourishing Shampoo and Conditioner, I applied Kids Shea Moisture Coconut & Hibiscus Curling Cream and Jamaican Black Castor Oil. I then cornrowed her hair. I just free-styled and got this result. 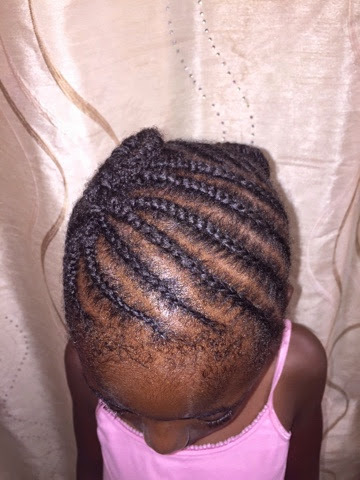 I used the SheaMoisture Edge Treatment to start all the cornrows so the edges would be smooth. Trust me, if you are a beginner, this is a great tip you want to use. That product gives a lot of shine and tames the edges. Besides, the castor oil component is beneficial to the growth or re-growth of the edges. I will be using the same routine I used for the last protective style. If you are wondering about cleansing and stuff, I did not wash her hair throughout the month. This is why I do not use tons of products in her hair. The Shea Moisture Yucca Mist is very light and does not leave any residue. The edge treatment was used only around the edges.